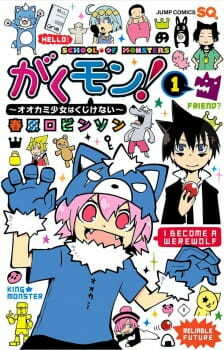 ”Wereman" Shushu's life is turned upside down when her father tells her that despite what she was told her entire life, she is in fact a female, and cannot become a wereman. To be certified as a wereman so she can become a public servant and let her father retire, she enrolls in Monster Academy. There, she meets Juzu, the son of the monster king who founded the school. Although he is feared by everyone due to his status, when her secret is exposed to the monster prince, she finds out that Juzu is in fact stupid, but is kind and just wanted a friend. With all the eyes of the students on Shushu and Juzu, the inconspicuous life Shushu so direly desired goes down the drain. Note: The third episode will begin streaming on December 4, 2014 to celebrate the release of the manga's first compiled book volume, which will ship in Japan the same day.